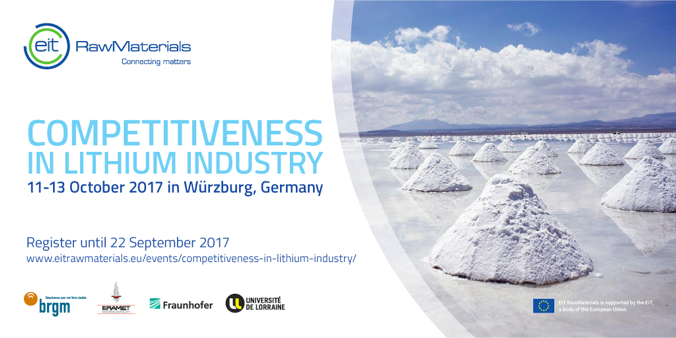 Save the date for the Workshop & Matchmaking event Competitiveness in Lithium Industry on 11-13 October 2017 in Würzburg, Germany. Lithium, a key element for glasses and ceramics, has also become critical to the energy transition driven by the rapid development of new energy storage solutions and the emergence of electric vehicles. Although the demand is continuously growing (2 to 3% per year), only few suppliers are present on this strategic market, most of them focussing on salars exploitation and none of them being European. As more players intend to position themselves in this difficult context, all lithium resources should be evaluated regardless of their origin. Indeed, the competitiveness of each resource will strongly depend on matching the resources with processing technologies, and ultimately on matching the resulting lithium products with their dedicated applications. Representatives from industry, academia and research along the entire Lithium value chain.